Bonne Chance (Good Luck) Graduate Artist Amie Kieffer. Inside reads "Go out into the world and bring what you have learned here with you: I have high hopes for you." JPII The back includes the complete Magnificat. 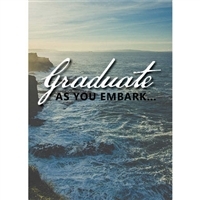 Go into the deep with your graduates. Affliction is inevitable - the wisdom of hoping in the Lord is the best advice for any graduate. The card is a journey itself - from the cover with water, to St. Paul's exhortation inside and finishes with the Gospel Mark 4:35-41 of Jesus calming the storm. Inside has the back drop of an anchor, the Christian symbol for hope. Set of 24 cards with white envelopes. "Sing a new song unto the Lord!" with artist Amie Kieffer's brilliant water color of a symphony of instruments. Musicians and those who enjoy listening alike will appreciate the ensemble surrounded by Psalm 98: "Sing praises to the Lord with the lyre and the sound of melody! With trumpets and the sound of the horn make a joyful noise before the King, the Lord!" Perfect for the Graduate Musician. Bundle of 12 cards and envelopes. 6 Graduate and 6 Traveling Lady.